Got Design Skills? You're a Code Genius? 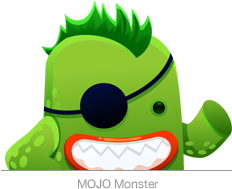 Earn BIG Money on MOJO Today! Hiya! I'm MOJO, nice to meet ya. Welcome! We'd love to have you as a seller. You can make some great cash and you'll have all the resources here to help you thrive with your business! Step 1: Create a FREE Account! Get started by setting up your new profile to look all shiny and new. Then start get ready to upload! 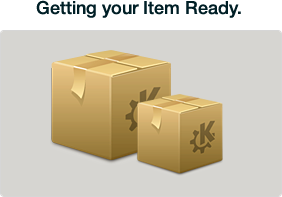 Step 2: Get your item Ready! Make sure you get your item ready to upload to the marketplace. Every item needs to be approved by us. Step 3: Start Making Money Now! Why Sell on MOJO? Exposure to 1,000's of Buyers + Our Team Loves You! But seriously we love you. Our marketplace was built with sellers in mind. The whole reason we exist and continue to grow like we do is because of our sellers. We strive every day to make it easier for you to upload your work on the marketplace. 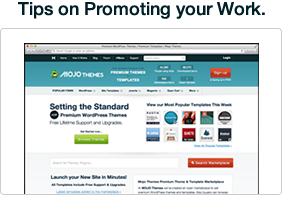 We want nothing more than you to be successful selling your work on MOJO. MOJO has grown to over 50,000+ users and the community is growing faster than it ever has! Showcase your work, your brand to potential new buyers, clients and more! We have been doing this for years now. Use our teams knowledge to help you build your portfolio, make more money and do this full time for your every day job! Challenge yourself to learn new skills and earn even more! We Bring Traffic, Processing, Delivery, Admin and More! Think about what you would spend on buildling your software to handle digital delivery, marketing expenses, admin expenses, chargebacks etc. We provide all of that PLUS, a massive built-in audience, more paid traffic, email blasts, large affiliates to promote your items and so much more! After countless hours of designing and programming, you've finally had your item approved for the marketplace. That same effort needs to be put into how you list your item on the marketplace. We've put together a more detailed sellers guide on how to create your images, description and even other promotional ideas for you! All of the sellers on the marketplace take pride in their work. Offering support and upgrades is a huge reason why your items will sell and continue to sell. In order to be successful with your item and future items remember to build loyalty with your buyers by offering top-notch support and on-going updates to your items. Heard about our Designer/Developer collab tool? JOINT FORCES IS HERE! Along with creating this awesome functionality for all the MOJO community, we've also created a dedicated section within the forums. You can chime in anytime to recruit new teammates or find that perfect designer or developer for your theme dream team. The possibilities are endless and we can't wait to see where this takes us. Learn more about JOINT FORCES! Still have questions? Read through our other Frequently Asked Questions. What type of items can I sell? We have categories for WordPress, Magento, Open Cart, Joomla, Tumblr, HTML Templates, Email Templates & PSD Templates. You can suggest a category as well anytime. Where do I give support for my items? All items are required to have support from the seller. Buyers will post questions on the actual item page under "Comments". To validate that they are a real buyer, when they post issues, you will see a red buyer tag next to their name. You may also have links within your item description to your own support forum if that is easier to provide support. Where do I submit updates & fixes to my item? Within your account you will be able to see all of your approved items. 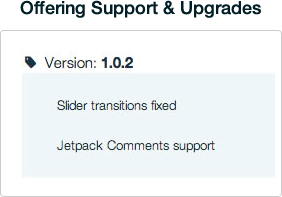 You can easily click the "Submit Change" button and update any info, update your changelog and attach the new final zip with the update files. Once approved, the item will go back on the homepage of the marketplace showing that your item has been updated. How often & how do I get paid? We send out payments every month on the 15th. The commissions paid on that day are for the previous month. We sent payouts using PayPal, MoneyBookers and also wire transfers if over $1,000.00 USD. Can I promote my Exclusive items? Of course! We encourage sellers to offer FREE giveaways, banner ads, promos on other sites, etc. The potential buyer will still make the purchase on the MOJO Marketplace so you're still within the guidelines for exclusive items. Can I remove my items any time? Absolutely. Just email our friendly support staff any time and we'll be happy to assist you.